Prior to my stay in downtown Indianapolis from April 29th to May 1st, I had no interest or experience with the world of comic book conventions. Even in the days preceding my visit, I found myself wishing I could be otherwise occupied. However, in my desperate attempt to find a quick and easy way to make a few dollars, I found myself standing outside the doors of the Indianapolis Convention Center ready for my first day of Indiana Comic Con. Despite my initial hesitation, I’d consider myself extremely and pleasantly surprised with the experience as a whole. I received my rather fabulous “staff” badge and was assigned a box office position for the weekend early Friday morning. Looking back now, this assignment was ideal for a Comic Con novice like myself. It allowed me to observe and interact with a high number of convention attendees, giving me a true understanding of the event's atmosphere. My first day on the job I was prepared to see the seemingly endless stream of stereotypical comic book superheroes, villains, and Star Wars and Star Trek characters. Surprisingly, a man dressed as Rob, accompanied by Toaster and Kirby from The Brave Little Toaster set the tone for my Comic Con adventure. Not long after my encounter with Rob, I saw a little girl dressed as Elsa from Frozen, another costumed as Belle from Beauty and the Beast, and more little girls flocking behind them. I wondered, what do these Disney animation characters have to do with Indiana Comic Con? As more and more characters from popular animation films poured into the box office, I decided to do some research. I found that Comic Con events feature not only comic culture and science fiction, but also games, art, movies, and more. Nearly every attendee had their own take on some element of pop culture. Whether it was their dress, their fan art, or simply their conversations, each individual's passion was both palpable and infectious. Although the convention attendees were more diverse than I had anticipated, the exhibit floor did feature books from almost every significant comic publisher. There were also numerous artists ready to paint all of the attendees' favorite characters. Not being a comic book veteran myself, during my free time I bypassed these booths and ventured to what was called the Hall of Heroes. Filled with a collection of props from popular films, the hall was a bit more relatable than the many rows of comic books featuring complex backstories and multiple universes. Who wouldn’t want to hold the original Captain America shield from the first Avengers film? Who would deny sitting on the original 65 Shelby Cobra that Robert Downey Jr. landed on during his first flight attempt in the first Iron Man movie? There were small charges to take pictures with the memorabilia, but the attendees did not seem to mind. For them, the experience of being able to live out the events of their favorite films was well worth the price. There were even some of the featured films' most famous actors available for photo opportunities and autographs. Even the hated Joffrey (Jack Gleeson) from Game of Thrones was present. The celebrities were readily available all day, until the Exhibit Hall closed at six. Though the Exhibit Hall closed fairly early every night, that was far from all Indiana Comic Con had to offer. Events throughout the rest of the Convention Center raged until midnight. There was Nerdy Speed Dating for those searching for their other half, Beginner Belly Dancing for the more adventurous individuals in the group, and a lightsaber fighting tournament for those who wanted to prove they’re really Luke Skywalker at heart. There was also a large Game Cave—a room that featured activities for the most competitive gamers, as well as for families who wanted to play a simple board game together. There was even a special after-party held on Saturday so attendees could dance the night away and celebrate a successful convention. The activities at Comic Con were never-ending. 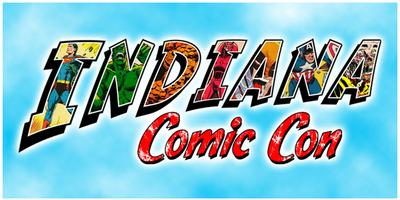 Spending an entire weekend at this event would be extremely easy to do for those die-hard Indiana comic book fans. Yet, at the same time, an encyclopedia-like understanding of the art is not required to enjoy Indiana Comic Con. If you can appreciate pop culture in general, Indiana Comic Con is for you. Bring your family, dress up as your favorite film characters, or simply come to people watch. The date for next year is already set, April 14-16 2017, you won’t want to miss it! All photos by the author unless otherwise stated.